Learn how to take measurements for sizing, and begin your journey on making your own clothing! “I’ll stop wearing black when they make a darker color” - Wednesday Addams - Make your own Needle Felted Wednesday to celebrate the Halloween Season! Build your own screen printing empire from home! 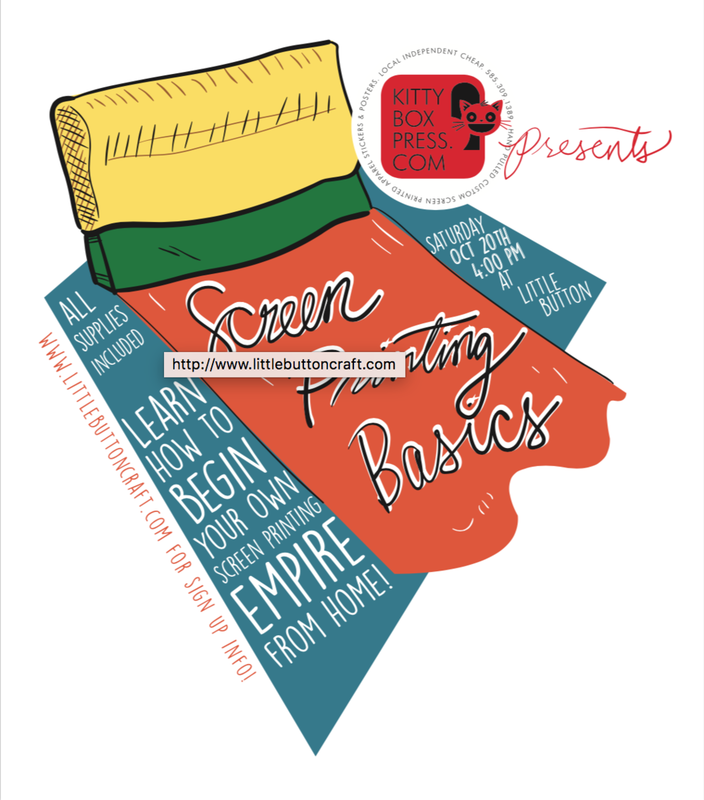 In this class you will work with Ian Egling of Kittybox Press to learn the basics of screen printing. You'll learn about different inks, things you can print on, the process of screen printing, and more! You'll even leave the class with your own trick-or-treat bag that you screen printed yourself! In this class you will learn how to make fingerless mitts. You will use skills like knit and purl stitches, as well as yarnovers. You will learn how to knit in the round on circular needles or double pointed needles to make a comfy and cozy pair of fingerless gloves! Knitting experience needed - Beginner skills, cast on, knit and purl. Learn to knit a basic scarf with this wonderful workshop! Learn the art of needle felting with Nancy Topolski. Learn how to needle felt and make an adorable dinosaur! Join Alice’s Table for a class on flower arrangement. Learn the skill of fabric braiding, new sewing experience needed! Kusudama Paper Flower Class on June 9th, 2018. If you’ve ever wanted to work with resin you can try it with the guidance from a local resin artist, Emilie Dawson, and create beautiful statement accessories. Experience the medium without having to invest in a lot of material and leave with multiple pieces of unique jewelry! Emilie will provide molds for pendants, beads, bracelets and coasters; the pendant molds can be adapted to several accessories so feel free to get even more out of the box and put it on headbands, pins or more! If you’re turning items into jewelry Emilie will also have available to you silver or gold jump rings, earring posts and a multi-sized hand drill. What we’ll provide: Resin, molds, medium tips and tricks, tons of fun glitter to customize your pieces and ideas on how to transform your items after they’ve set. What you can bring: mementos like photos (think locket sized), dried flowers, specific nail polish or paint colors, anything you’ve been inspired by and want to immortalize in resin!